Director J.J. Abrams says that Leia in The Force Awakens made a decision to become a general instead of a Jedi. "The Force runs strong in my family. My father has it. I have it. And my sister has it." With those famous words Luke Skywalker made one thing clear in Return of the Jedi, Leia, his long lost twin, had the potential to be a Jedi. Latching onto that, many of the creators behind the Expanded Universe wrote books and comics exploring Leia's journey to unlock her potential. Then Disney bought Star Wars and everything changed. The Expanded Universe was declared non-canonical and Leia, it's been revealed, would go on to take a different path than what had previously been imagined. 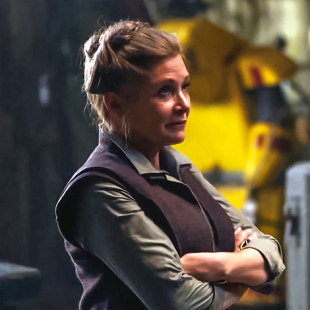 Speaking about this issue recently, Star Wars: The Force Awakens director J.J. Abrams decided to shed a little bit of light on the state of Leia in the film and why she chose not to train as a Jedi in the new version of post-Jedi events. In an interview, Abrams revealed that Leia's Force potential is something that the film's creative team discussed at some length. "It was a great question, and one that we talked about quite a bit, even with Carrie [Fisher]: If there was another, why did she not take advantage of this natural Force strength that this character had?" he said. "One of the answers was that it was simply a choice that she made, that her decision to run the Rebellion - ultimately, this Resistance - and consider herself a general, as opposed to a Jedi, it was simply a choice she took. Not that there was any regret that she could have and didn't, but clearly we've seen, and we do again, she's still Force-strong, and it's something that is an intrinsic piece of her character." In other words, even though she had the pieces ready, she was too busy to put the puzzle together. While I could understand this approach bothering some fans who were invested in the idea of Leia taking up a lightsaber, I personally have to say that I actually like her not going that route. It kind of fits with her character. Throughout the original trilogy, she was often portrayed as one of the more rational and pragmatic members of the main cast. She was a leader, devoted to the Rebellion and the fight against the Empire. Considering the fact that the new Star Wars canon potentially includes years of post-Jedi warfare against the remnants of the Empire, it makes sense that she might be too distracted by the demands of leadership to explore her lineage with the Force. Suffice it to say, we'll be interested to learn more about how her story played out when The Force Awakens hits theaters next week on December 18th.